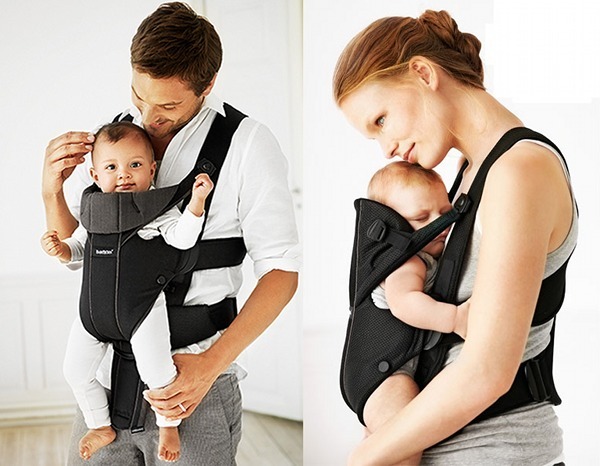 Just in time for the hot weather are two new releases from Baby Bjorn; the advanced Miracle carrier now with the benefits of airy mesh or organic cotton fabrics! We’ve seen first hand how the Baby Bjorn Baby Carrier Miracle works, with its adjustable waist and hip mechanism so you can individualise the fit according to where you carry weight most comfortably. Baby is secure and relaxed, with both of you reaping the benefits of baby carrying. Our writer Anita reviewed the then newly-released Miracle back in June and was thrilled with the way the carrier worked for her and her new baby Archie. Now the Baby Carrier Miracle is available in two new versions, perfect for those summer bundles of joy; Airy Mesh (above right) and Organic Cotton (above left). The mesh carrier is constructed from a variety of breathable, lightweight 3D fabrics which allows for airflow and easy moisture transferral. With the increasing demand for organic products, and with the popularity of previous organic carrier releases, Baby Bjorn decided to release the Miracle in the choice of organic cotton. Get the mesh version on pre-order from Minimee for $229.95 for a mid-November delivery. The organic cotton model is also available for pre-order with delivery in mid to late December. If it’s for a Christmas gift, best to go for the mesh.